The Minneapolis Park and Recreation Board is one of the most influential but under-the-radar local government bodies in Minnesota. Created by the Legislature and ratified by voters in Minneapolis 130 years ago, the board oversees a proposed 2014 general operating budget of about $66 million, runs its own police force, and manages about 6,744 acres of land and water in the city, including golf courses, gardens, bike and walking trails, playgrounds, and local and regional parks. The park system logs about 18 million visits annually, meaning good management of park resources is vital not just to the city but to the entire Twin Cities metro area, with regional residents enjoying these amenities in large numbers. The Park Board’s nine commissioners serve four-year terms, with six representing specific areas of Minneapolis and three “at-large” commissioners serving as citywide representatives. The Star Tribune Editorial Board is endorsing in the at-large race. Ten candidates are competing for the three at-large seats, including one vacated by longtime Park Board Commissioner Bob Fine, who is running for mayor. The at-large field includes two incumbents, in addition to a former Park Board commissioner who is seeking to serve again and several candidates who have run in previous races. The candidates were well-informed and passionate about Park Board issues, making it challenging to winnow the field. But John Erwin, M. Annie Young and Jason Stone stood out as the strongest candidates and merit our endorsement. This entry was posted in Uncategorized on October 25, 2013 by citoyen1789. There will be a public hearing on the Minnehaha Refectory Reinvestment plan on Wednesday, November 6 at 6:30pm in the Board Room of the Minneapolis Park and Recreation Board, 2117 West River Road, MN 55411. Interested individuals can sign up to speak at the meeting. The public can view the reinvestment plan and leave comments online: http://www.minneapolisparks.org/default.asp?PageID=1457 where they can also sign up for email announcements about this topic and other topics by clicking on the red envelope icon. For those who require language translation or other accommodations, please contact 612-230-6473 at least 24 hours in advance of the public meetings. The owners of a building near the Chain of Lakes in Minneapolis could face a lawsuit from the city for discharging thousands of gallons of water an hour into the nearby lakes through a storm sewer. 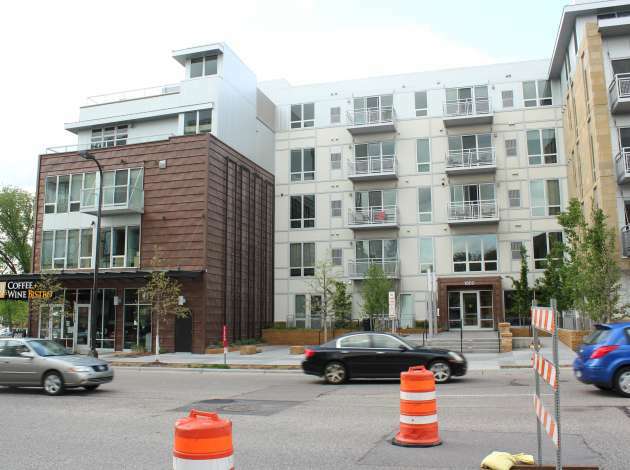 The Minneapolis City Council has authorized a lawsuit against Lake and Knox LLC, the owners of the luxury apartment building 1800 Lake on Calhoun, according to a statement released Monday. This entry was posted in Lake & Knox Water Discharge on October 24, 2013 by citoyen1789. The following article by Sarah McKenzie was published in the August 29, 2013 issue of the Southwest Journal. It is posted here to provide background information on the current Southwest LRT controversy. The candidates for Minneapolis mayor discussed what to do about the increasingly contentious Southwest LRT line, among other topics, at a debate hosted by former MPR radio host Gary Eichten at the State Fair earlier today (Note: the debate took place on August 26; see http://minnesota.publicradio.org/display/web/2013/08/26/mpr_news_presents ). The proposed light rail line, which would link downtown and Eden Prairie, is facing opposition from Minneapolis and St. Louis Park about proposed plans to deal with freight traffic reroutes. Minneapolis homeowners and community leaders object to co-locating the LRT line next to existing freight train traffic in the Kenilworth Corridor, and St. Louis park officials and residents are also opposed to having freight trains rerouted to the city. This entry was posted in Southwest LRT on October 23, 2013 by citoyen1789. The city plans to sue the owners of 1800 Lake on Calhoun over the illegal discharge of groundwater. The Minneapolis City Council may take the owner of an Uptown luxury apartment building to court over what it the city says is the illegal discharge of groundwater into the Chain of Lakes. Pumps must move an estimated 170 gallons of groundwater per minute away from the foundation of 1800 Lake on Calhoun in order to keep the building’s two stories of underground parking dry. The constant flow through the storm sewer means city crews can’t access nearby sewer pipes for maintenance. The 55-degree groundwater pours continuously from a storm sewer outlet into the lagoon between Lake Calhoun and Lake of the Isles. In the winter, thin ice and open water in the lagoon create a hazard for cross country skiers and others out on the lakes. This entry was posted in Lake & Knox Water Discharge on October 23, 2013 by citoyen1789. This special meeting will be held at Park Board headquarters, 2117 West River Road, just north of Broadway Pizza. The agenda shows that the Board will discuss three legal items in closed session (meaning that the public not be admitted and the meeting will not be telecast). The agenda also says that, “Any action items resulting from the closed session will be added to the agenda as New Business following the closed session.” In other words, if the Board decides they need to vote on something, they will adjourn the closed session, open a public meeting, and then take the vote. They may or may not have an open meeting with a vote, depending on what happens in the closed session. Board meeting agendas and related information are posted on www.minneapolisparks.org two business days prior to meetings. This entry was posted in Board Meetings on October 23, 2013 by citoyen1789. St. Louis Park on Thursday threatened to fight any new attempt to reroute freight trains into its community to make room for the Southwest Corridor light-rail line in a recreational corridor of Minneapolis. In a letter to Gov. Mark Dayton, St. Louis Park Mayor Jeffrey Jacobs wrote that “it will be difficult to see a path forward” if another study leads policymakers to recommend a new freight route through the suburb. Jacobs threatened that the suburb would withhold consent for a reroute, a move that could jeopardize the metro area’s largest transit project. This entry was posted in Southwest LRT on October 21, 2013 by citoyen1789. The decision to delay the Twin Cities’ biggest light-rail project drew protests and warnings Wednesday from two policymakers who have been closely involved in planning the line. They objected to postponing a crucial vote on whether to build two tunnels as part of the Southwest Corridor line that will connect Minneapolis with Eden Prairie and southwestern suburbs. The delay of as much as three months is intended to give planners time to build support for the tunnels in Minneapolis, where some officials and residents fear disruption to a neighborhood and a recreation area. “This is going to be a huge setback,” said Steve Elkins, a member of the Metropolitan Council, the agency overseeing the project. Elkins and Munt fear the delay could cost the $1.55 billion project its best chance to win needed federal funding.